In commercial and industrial buildings, High Intensity Discharge, or HID, light fixtures are commonly found. These are high voltage fixtures that use a mix of metals and gases to create a bright and powerful white light. With each year, and as technology continues to advance, there are far more options for lighting than ever before. Among the most energy efficient options for illuminating any space are LEDs. Naturally, the larger the space, the greater the opportunity for savings. Making the switch from an HID light fixture to a high bay LED retrofit in your facility provides great savings in energy, energy costs, and much more. While HID light fixtures are the standard, their high voltage and wattage requirements result in high energy consumption. This leads to the cost of energy going up along with it. In contrast, LEDs are powered when a microchip receives an electrical current to create the light. The difference in technology is how a 90-watt high bay LED can replace a 400-watt HID light fixture. In addition, LEDs contain technology called a heat sink, which absorbs the heat that is created by the light. Heat sink technology allows for up to 20% in air conditioning savings, furthering savings in energy costs. As if this isn’t enough, many of these energy saving lights are also DLC listed. This rating means that many of these fixtures qualify for energy rebates with local utility companies. High bay fixtures are designed for use in buildings with ceilings that are typically 20 to 45 feet in height. This makes them ideal for installation in gymnasiums, manufacturing plants, factories, warehouses, and other structures with high ceilings. Spaces such as these require illumination from all sides, and the LEDs provide it. 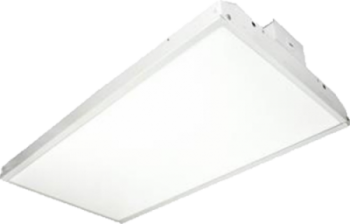 The high bay LED retrofit is not only energy efficient, but long lasting. On average, they last as long as 50,000 hours. The long lifespan reduces the need for frequent replacement, which is ideal given how high up they’re installed! The focus of LED lighting technology is on their power. They are designed to provide illumination of the highest quality without sacrifice. These energy efficient fixtures deliver brilliant light without affecting the temperature of the building, while saving energy and reducing energy costs from the moment they’re installed. ← Does Ballast Compatibility Matter When Choosing LED T8 Lamps?